4d silver groat, London, 1660–1662 (ANS 1963.6.3). Today is Maundy Thursday (the Thursday before Easter), which for Christians signifies the day on which Jesus washed the feet of his disciples (John 13:1–17) while instructing them to love one another (John 13:34). It is also the day of the Last Supper. Maundy Thursday also has numismatic significance by way of the Royal Maundy, a religious service in the Church of England. Current practice holds that the Queen (or a royal official) gives out two purses of coins to elderly recipients as symbolic alms. A red purse holds money for the poor to buy food and clothing, while a white purse contains the special Maundy money. Recipients in the contemporary service are chosen based on their service to their communities around England. This tradition of the distribution of alms in England by a monarch dates back to the reign of King John (r. 1199–1216) who in 1213 gave 13 pence each to 13 poor men in Rochester, Kent in a Maundy ceremony. In the early tradition of Maundy money, the coins used were circulated and not marked as Maundy alms. This changed in 1752 when the Royal Mint began to produce specialized sets of Maundy money based on coins not struck for circulation. These sets included one silver coin each in denominations of 1d, 2d, 3d, and 4d. The obverses sport the bust of the reigning monarch, and the reverses (since 1822) feature the denomination topped by a crown and encircled by an oak wreath. There are 430 specimens of Maundy money in the ANS’s collection, one of which is illustrated in MANTIS (pictured above). 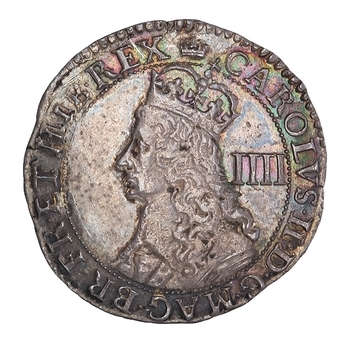 This 4d silver groat, minted in London between 1660 and 1662 under the authority of Charles II, was traditionally called a “Maundy piece,” this coin exemplifying the Simon issue of 1660–1662. In actuality, this coin was part of a mintage for circulation. The ANS library holds 94 publications on the Maundy tradition. The distribution of Maundy money changes each year. In 2017, Queen Elizabeth II will give away the coins in Leicester Cathedral.